Bilateral ties and cooperation within the BRICS bloc were discussed at the 5th India-China Strategic Dialogue held at New Delhi on Tuesday. 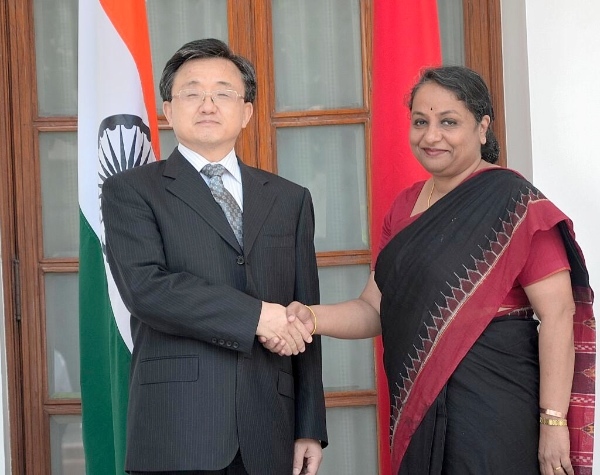 India’s new Foreign Secretary Sujatha Singh met China’s Vice Foreign Minister Liu Zhenmin for talks on bilateral, regional and global issues of mutual interest. “The two sides also discussed the possibility of a visit to China, later this year, by Prime Minster Dr. Manmohan Singh,” said a statement issued by India’s Ministry of External Affairs. Singh is expected to travel to Beijing in October. Expanding trade and investment, including prospects of BCIM (Bangladesh-China-India-Myanmar Regional Forum) cooperation were explored in Tuesday’s meet. Consultations have been held earlier on the feasibility of a BCIM Economic corridor, a region host to 40% of the world’s population. The India-China strategic dialogue was held on Tuesday after a gap of nearly three years. India and China have set a trade target of $100 billion by 2015. The two sides also discussed ways of utilization of trans-border river waters. India and China do not have any water-sharing agreements, but instead have instituted a mechanism to exchange data on trans-border rivers through a working group including information on the measurement of flows. China and India also discussed “ways of maintaining peace and tranquility along the Line of Actual Control (LAC) in the India-China border area,” said the statement. Chinese and Indian officials also shared concerns over the “outlook for Afghanistan in 2014 and beyond”. The two Asian giants had recently held a strategic dialogue on Central Asia, focusing on their “very similar” approaches to regional and energy security in the strategically important region. Meanwhile, Chinese Vice Foreign Minister Liu also met Indian External Affairs Minister Salman Khurshid on Tuesday. A series of high-profile meetings including visits by Chinese Premier Li Keqiang to India in March and Indian Defence and External Affairs Minister to Beijing earlier have boosted ties between the two neighbours. The 6th India-China Strategic Dialogue will now be held in Beijing.